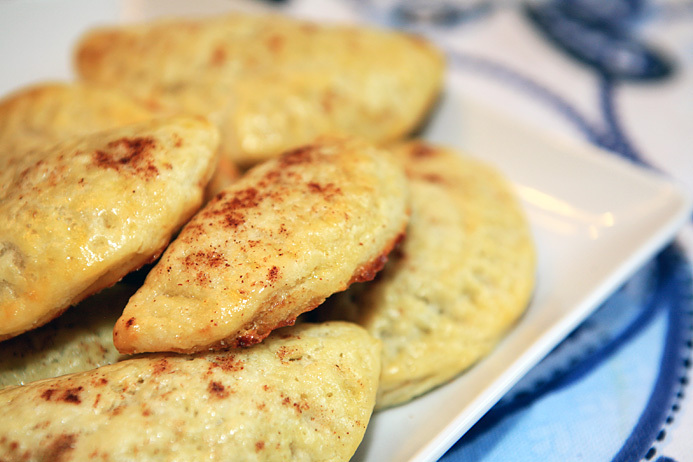 We have figured out a way to take the flavors of autumn and bake it into a decadent empanada. We made these on a Saturday morning and they were gone by noon. They were INCREDIBLE. The cream cheese gave the dough a tangy flavor while the filling is warm with flavors of apple and cinnamon. This recipe is the perfect comfort treat on a crisp fall afternoon. Oh, and maybe make a double, or even triple batch. These yummy treats will go fast! First you want to start by making the filling. In a medium size pot, melt butter over medium low heat. Add in chopped apples with a pinch of salt. Allow the apples to cook down and soften, 10-15 minutes. Add raisins and apple butter. Allow to cook over low heat for 15-20 minutes. The apples will continue to melt down into the apple butter and the raisins will become plump. Remove from heat and place into a food storage container. Chill while making dough. Preheat the oven to 350. To a food processor, add flour, sugar and salt. Pulse ingredients to mix. Add in the butter and process until the mixture resembles wet sand. Add the cream cheese and pulse until the dough comes together in large clumps. Place the dough on a floured surface and gently knead, just enough to incorporate the cream cheese. Form the dough into an oval disk, place in a plastic bag and chill for at least one hour. Roll the dough out. Cut the dough into large circles using a biscuit cutter. If the dough starts to feel tacky, place it in the freezer for about 5 minutes, this will allow the cream cheese and butter to firm up. Beat 1 teaspoon water and the egg in a small bow to make an egg wash. Fill each round with about 1 tsp of the apple filling. Use your fingertips to moisten the dough edges with a little water. Fold the dough over to create a half moon. Use your fingers to press the dough gently together, and then crimp the seal with a fork. Brush the tops of the half-moons with the egg wash. Sprinkle the egg washed-tops with the cinnamon sugar mixture. Place the half-moons on a baking sheet lined with parchment and bake until golden brown, about 15 minutes. The filling will be hot, so cool the empanadas about 15 minutes before eating.